I spoke to a 10th grade assembly, and then a 12th grade one, at Assumption School today. 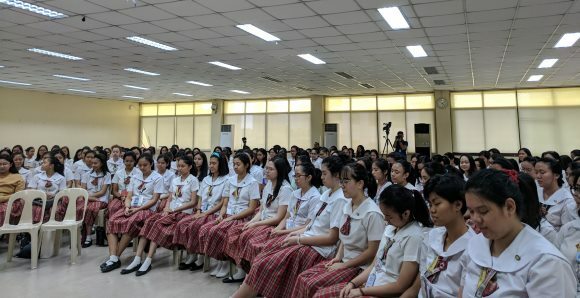 To the 10th graders, I asked if they felt that human beings were fundamentally selfish with a few moments of kindness, or fundamentally kind with a few moments of selfishness. It produced some very spirited responses -- from "blank slate" to "kind". In particular, I was quite touched by one fellow who spoke candidly and concluded, "I've been bullied a lot, so I have good reason to believe that people are mean. But I don't want to believe that. I think we can always be kind." And another girl who asked, "How can we make sure we don't turn into the monster that we hate?" With the 12th graders (below, doing a minute of silence), I spoke about four years of compassion college -- and they, too, had a lot to share. What is the line between self care and selflessness? What if our kindness is taken advantage of? When I asked them about a 21-day challenge, turns out they had already done one! To celebrate the birthday of the school founder, Mary Eugenie, they all took the day off and just did acts of kindness!